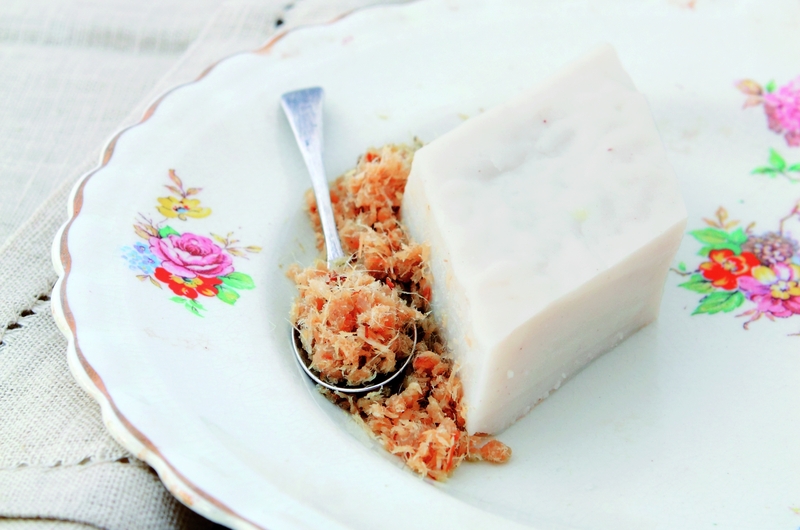 Rich and savoury desserts are a peculiarity of the East Coast, and this kuih is topped with a salty sweet fish floss. Sieve the rice flour and tapioca flour together. Mix the flours with the coconut milk and salt, and strain. Cook mixture in a saucepan over low heat, stirring, until thickened, about 10 minutes. Pour the mixture into an oiiled (24cm diametre) pan - the mixture should reach a height of 3-4cm. Smooth the surface with a banana leaf or spatula. Prepare a steamer. When hot, steam the rice-coconut mixture for about 40 minutes. Cool completely before cutting. Cut the Koleh Lemak into pieces and serve with Sambal Ikan topping.